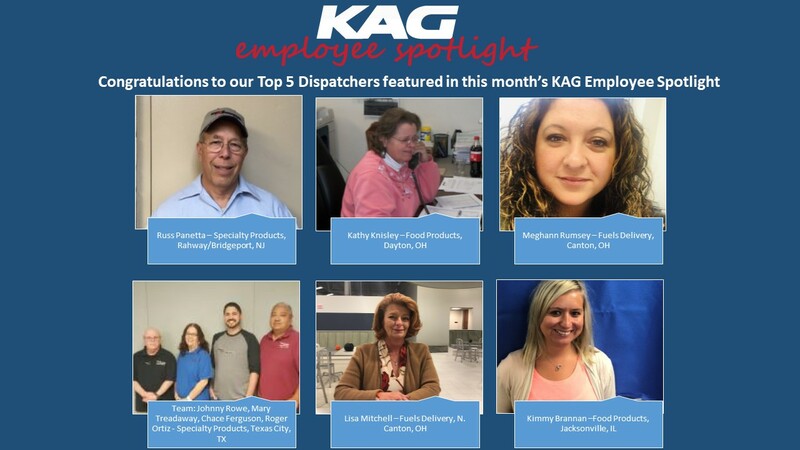 This month’s KAG Employee Spotlight focuses on our dedicated KAG Dispatchers. We reached out to our Drivers and Managers across North America asking them to submit nominations for Dispatchers who go above and beyond their regular work to role model what it’s like to be Dispatcher at KAG. As always, we had an incredible response! And, with 237 nominations it was very challenging to choose only 5! So, we selected a Dispatch Team as well! Congratulations to all the nominees and thank you for all you do! Russ is always positive and he keeps his promises. He shows respect to all of his Drivers while giving constructive criticism in a professional manner. Kathy is committed to doing the right thing for KAG and for her Drivers. She takes the time to learn about her Drivers and their families. She is caring and compassionate. Kathy’s compassion for people can be seen through her actions. One of our Drivers had an elderly mother who could not be left alone. Kathy stayed with the mother so the Driver could work his weekend shift. She has also been known to pick up Drivers for work if they have transportation issues. Meghann is always going above and beyond to help Drivers, solve issues and supply customers with alternate solutions to improve efficiency. Along with dispatching, Meghann has elevated her career to take on terminal training and higher level functions so that she can better serve KAG. Meghann has been a team member for over 10 years with KAG. She started as a data entry temp, but that was just the beginning of her career. In her time to follow she has held numerus positions to include inventory management specialist, customer service representative, CRSC dispatcher, and currently the PCT Northeast Dispatch Operations Coordinator. Lisa consistently works as a team player. She is proactive in her communication and seeks options when obstacles arise. She is always professional and remains calm when confronted with issues. Lisa understands that regardless of the name of the division, we ALL work together to provide excellent service for OUR customers. Last week Lisa contacted KAG Logistics to say that she would be short on Drivers for the upcoming weekend. She went on to explain that she would have a decent amount of capacity on Thursday, a full crew on Friday and asked that we fill up sites heading into the weekend to avoid late loads and potential runouts. With that knowledge, we were able to reach out to customers, order extra deliveries and alleviate capacity constraints going into the weekend. The best part about Lisa’s request is that she wasn’t working the entire weekend; her counterpart works on Sunday. Not only was Lisa looking out for our customers, but she was looking out for her other Dispatchers! Kimmy Brannan joined KAG in 2016 with no previous experience in the trucking industry. But, she came with a willing attitude to learn. Her success is due to her positive attitude and great listening skills. She communicates respectfully to each of her Drivers and her Drivers communicate with this same level of respect in return. “Drivers consistently tell me how awesome Kimmy is,” said Terminal Manager Cheryl Davis. She manages to accommodate their home lives without jeopardizing service to the customers. Kimmy makes sure that her Drivers have a full week of work and that their equipment is serviced and safe. She always considers their safety first, as her Drivers primarily run loads in the Iowa, Wisconsin, Nebraska and Minnesota areas where driving conditions can be dangerous. “Performance through adversity – that’s what makes this dispatch team great,” said Terminal Manager Nathan Massey. When the former manager took a sudden leave, this team pulled together to keep operations running smoothly. The process to find a new manager took almost a year. But, through communication, collaboration and patience, the Texas City Dispatchers pressed on through a challenging transition. Roger Ortiz’ industry career began with Citgo as a Tank Washer, then with Enterprise when they purchased Citgo. He has been a KAG Dispatcher in Texas City for eight years. Johnny Rowe has been in the trucking industry for 46 years – 21 of those years have been with KAG as a Dispatcher in Texas City. Mary Treadaway’s career with KAG began as a temporary employee with Enterprise in 2011. She accepted a full time Dispatch position in 2013. Chace Ferguson also began his KAG career with Enterprise in 2008 at the Texas City terminal where he worked as a Tank Washer. He has been a KAG Dispatcher since 2014.